I’ve seen this from other food/recipe bloggers before and I was amazed.. moist and soft chocolate cake without using an oven..wow! How I wish that I knew this way, way back..*sigh*. This cake is really easy to make (of course it is or I would not have bothered) and expect a delicious cake at the end, you may use your favorite frosting to serve or simply dust it with powdered sugar on top or turn it into a beautifully decorated 2-layer cake, your call. I just want it simply with a fudge frosting.. I have a can of dulce de leche that is beginning to crystallized, I heated it up with some grated chocolate and just poured it on top of chocolate cake..yum! A light and airy chocolate cake you can make without using an oven. Serve it plain or with your favorite frosting. Line and grease a 8 or 9 inch baking pan; set aside. Melt butter in a saucepan, add oil, evaporated milk and sugar; stir over low heat until sugar is dissolved. Take off fire and slightly cool, add the beaten eggs and stir until well mixed. Fold flour mixture into the egg mixture (or the other way around, it doesn't make any difference) mix well until there are no more lumps. Pour into the prepared pan and place into the steamer and cover the top of the pan loosely with a piece of aluminium foil. Steam over medium heat for 45 mins. Cool the cake for about 10 minutes in the pan before turning out onto a wire rack. Heat dulce de leche and chocolate in a double boiler or a heavy bottomed pan over low heat; when chocolate is completely melted, stir well and let cool before using. The dulce de leche frosting is a bit runny and heavy at the same time like a soft fudge and forms a crust on top; not good for piping or decorations. 3 Responses to "Steamed Chocolate Cake"
Yes, I have steamed this cake so many times before and they were a hit with the boys! 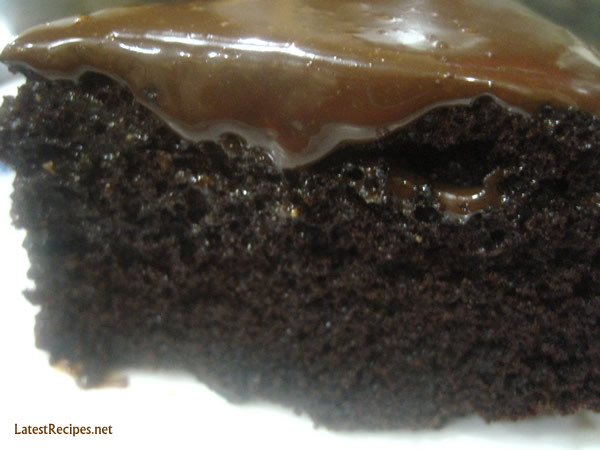 Your ganache sounds good and so simple! Wow….that looks very moist. I always love steamed cakes. It has it’s fine, nice texture. Would love to try one day. Thanks very much for sharing. Hope you a have wonderful weekend.